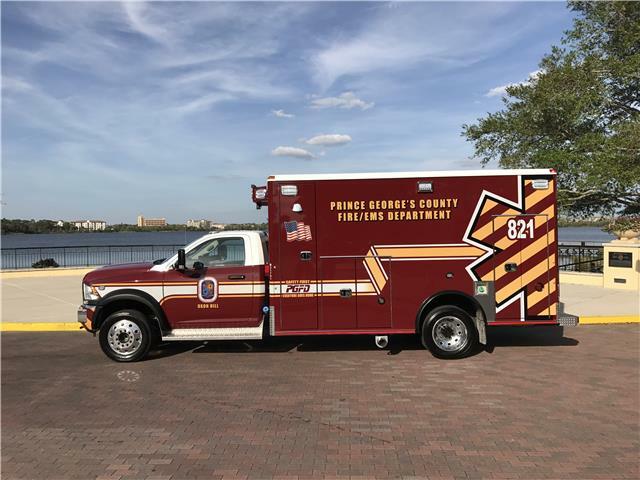 The Prince George’s County Fire/Emergency Medical Services (EMS) Department recently accepted delivery of new transport ambulances with two already placed into service. A total of nine units will have been delivered by the end of the month with another eight being constructed and delivered later this year. The 17 new units will replace older units that will be deadlined or placed into the reserve fleet. 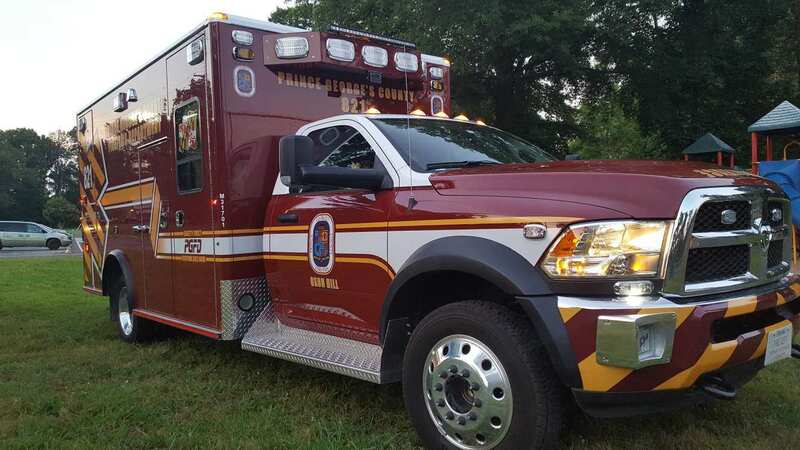 One unit already placed in service is at Fire/EMS Station 842 on Marcy Avenue in Oxon Hill, this unit will serve as a Basic Life Support ambulance. The second unit will be designated as a Paramedic Ambulance at Fire/EMS Station 821, located on Livingston Road. 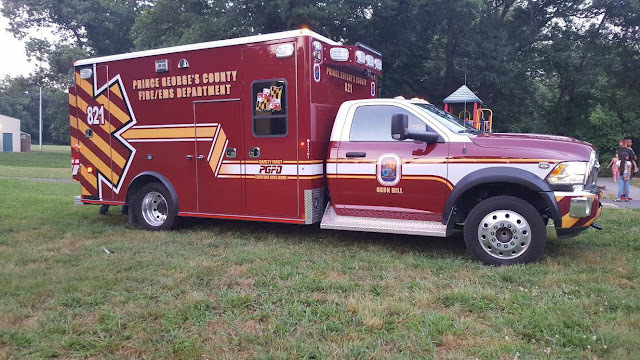 The County’s Fire/EMS Department is a combination career/volunteer agency that provides services to include fire prevention, fire protection, emergency medical services, and community outreach programs for residents of Prince George’s County, Maryland. It is composed of 45 fire/EMS stations, of which some are all career, all volunteer, or a combination of both. Currently, there are 900 career and civilian employees and 1500 volunteer members. The Department covers a response area of about 500 square miles, protects close to a million people, and has an annual operating budget of 190 million dollars. Last year, the organization responded to approximately 150,000 calls, 80 percent of them were for EMS. At this time, the Prince George’s County Fire/EMS Department is the largest and busiest combination department in the United States. The 2017 model-year ambulances have been redesigned to the newest safety standards. Built on a Dodge 5500 Chassis and powered by a 6.71 Cummins Diesel Motor with a 6-speed heavy duty transmission, these units have safety features not currently available on the Department’s past units. Additional vehicle features include a Liquid Spring Suspension to assist in a smooth ride for both providers and patients. 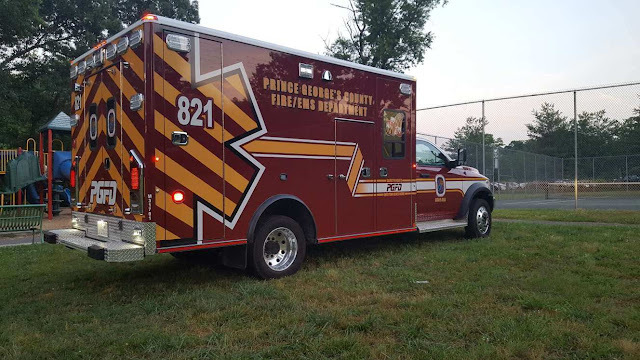 The units are equipped with a Whelen LED Emergency Lighting package, custom PGFD door forward design, and custom exterior and interior design. This new design will put all medical equipment within reach of the EMS provider, allowing them to remain seat-belted while providing the highest quality of medical care to our patients. A Stryker Power Load System and Power Cot assists in lifting the patient into the treatment area of the unit and reduces injuries to providers. 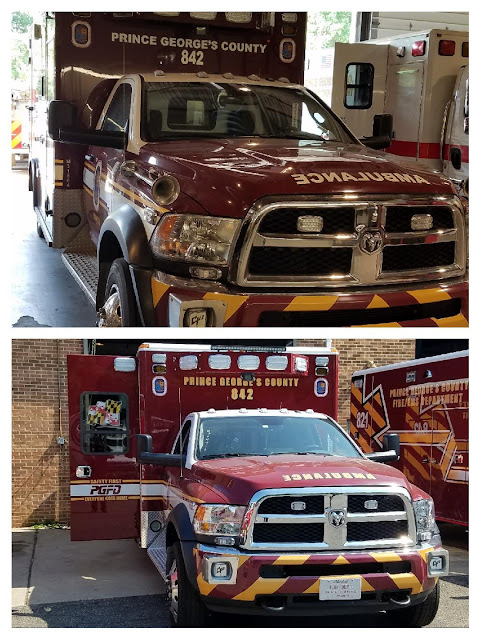 This is the first time in over 20 years that the Fire/EMS Department has made such a dramatic change to its ambulance fleet. These units represent the most innovative pieces in our convoy and will replace transport units to be placed into the reserve fleet. Paramedic Ambulance 821 is built on a 4X4 chassis, while Ambulance 842 is built on a 4x2 chassis. The costs of the units are $277,000 and $272,000, respectively.